I just knew it was going to look so pretty. My husband and I were thrilled to be first-time homeowners. We weren’t as excited about the 10-year-old, dark orange carpeting throughout most of the house. I wanted something to lighten the place up. So, I decided white carpeting would be a brilliant choice. And it did accomplish that goal. It looked gorgeous. Until we actually had to, you know, walk on it. We quickly became resentful slaves to that white carpet. We religiously took our shoes off at the door. We (okay, just me!) panicked when company came over because they didn’t obsessively remove their footwear like we did. And then we had a baby. And then another. I don’t care what the guy at the carpet store told us. Spit-up sweet potatoes and spilled grape juice do not come out of white carpeting. In other words, white carpeting was beautiful, but it just didn’t work in the real world. It couldn’t stand up to the realities and circumstances of daily life. That’s not how we want our kids to view their Christian faith: Nice, but simply not usable in the real world. That would be a crime. Because after nearly a lifetime of following Jesus, I know firsthand that He is extremely relevant. I’ve told my kids many times that I believe the Bible is true because it proves itself to be true — over and over. When I apply the things from the Bible, I see how God keeps His promises. When I pray and spend time with God, I can feel His presence and direction in my life. Even in the small things. Time and time again, I’ve felt that nudge from the Holy Spirit that’s saved me from a foolish choice. I’ve watched Him provide in miraculous ways for my son’s chronic illness. I’ve experienced His loving rescue from my need to please others — and the havoc it was reeking on my health and family. So how can we help our children be confident that their faith will meet and withstand the wear-and-tear realities of life? Put books — starting with the Good Book — into their hands. From the time my kids were little, we read Scripture and a devotional at dinner. Kids attention spans are short — doesn’t matter if they’re toddlers or teens. We keep it brief, then talk about how they could apply that principle to their own lives. How would they benefit? What could be consequences of not following that principle? Some great talks have stemmed from these small bits of time reflecting on God’s Word. Sometimes it has been a total bust! However, the consistent focus on applying God’s Word to everyday life — even for 5 to 10 minute windows — over many years, adds up. Each time, the Holy Spirit works through His Word and speaks to their hearts. I also always try to make sure my kids always have a devotional book they can read on their own. Now that they’re teens, I usually research a few options I think they’d like and let them choose. I focus on ones that show how to they can live out their faith in the their teenage culture and environment. Pray throughout the day. Since my kids were small, we’d stop often and pray about things that concerned us. A lost toy. A bad day. A scraped knee. I wanted to establish early and often they God cared about it all. And He wants us to turn to Him throughout the day for comfort and guidance. Now that they’re older, my kids both pray often throughout their day. They ask me to pray for things that concern them. And they often make the connection between their prayers and how they see God working in their circumstances. 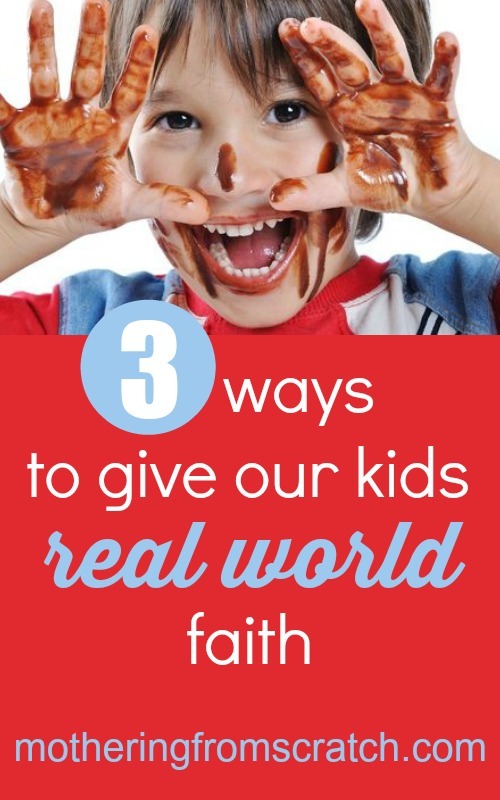 Our kids don’t inherit faith like they do our eye color or the shape of our nose. 2.) Look for everyday opportunities to practice faith. Working in the church nursery, volunteering at the homeless shelter, donating clothes and toys to charity. It’s important for us to seek out opportunities for our kids to serve. Kids can be selfish. We all can be! But when they see the positive impact they can have on others, they want more of that. I’ve watched it firsthand. We also need to train them to look for unplanned opportunities to live out their faith in the everyday. Helping the older woman in the parking lot who is having difficulty loading her groceries. Buying a meal and taking it to the homeless man on the street corner. Not long ago, my son and I helped a woman at Walmart who had Alzheimer’s. She had gotten separated from her husband and was wandering around confused and scared. Those are ways our kids see how what they learn in church applies to everyday life. 3.) Share what God is doing in our lives. As adults, we’ve seen many times how God has helped us through difficulties, how He’s stretched us and shaped our character. We have to share this with our kids — both things in our past and how He’s working in our lives today. Are you working on controlling your anger? Being less critical? Share how God is helping you grow and change. They need to see that we’re not just going through the motions. An upclose example speaks volumes about the benefits of pursuing a relationship with God that is a real, active and practical guiding force in their life. Our kids don’t inherit faith like they do our eye color or the shape of our nose. We have to be intentional and deliberate about making it real and accessible to them. Then it’s their choice to make it their own. We have to trust the Holy Spirit to speak to their hearts in ways that we can’t. They’ll find that faith in God meets them powerfully and practically in all their real world circumstances — unlike my white carpeting.